The National Guard (French: Garde nationale) is a French military, gendarmerie, and police reserve force, active in its current form since 2016 but originally founded in 1789 after the French Revolution. For most of its history the National Guard, particularly its officers, has been widely viewed as loyal to middle-class interests. It was founded as separate from the French Army and existed both for policing and as a military reserve. However, in its original stages from 1792 to 1795, the National Guard was perceived as revolutionary and the lower ranks were identified with sans-culottes. It experienced a period of official dissolution from 1827 to 1830, but was reestablished. Soon after the Franco-Prussian War of 1870–71, the National Guard in Paris again became viewed as dangerously revolutionary, which contributed to its dissolution in 1871. In 2016, France announced the reestablishment of the National Guard in response to a series of terrorist attacks in the country. The raising of a "Bourgeois Guard" ("garde bourgeoise") for Paris was discussed by the National Assembly on 11 July 1789 in response to the King's sudden and alarming replacement of prime minister Jacques Necker with the Baron de Breteuil on that day. The replacement caused rapidly spread anger and violence throughout Paris. The National Assembly declared the formation of a "Bourgeois Militia" ("milice bourgeoise") on 13 July. In the early morning of the next day, the search for weapons for this new militia led to the storming of the Hotel des Invalides and then the storming of the Bastille. Lafayette was elected to the post of commander in chief of the Bourgeois Militia on 14 July, and it was renamed the "National Guard". Similar bodies were spontaneously created in the towns and rural districts of France in response to widespread fears of chaos or counter-revolution. When the French Guards mutinied and were disbanded during the same month, the majority of this former royal regiment's rank and file became the full-time cadre of the Paris National Guard. Initially each city, town and village maintained its own National Guard, until they were united on 14 July 1790 under Lafayette, who was appointed "Commandant General of all the National Guards of the Kingdom". 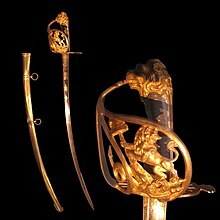 Lafayette's sabre as general of the Garde nationale. On display at the Musée de l'Armée, Paris. The officers of the National Guard were elected. Under the law of 14 October 1791, all active citizens and their children over 18 years were obliged to enlist in the National Guard. Their role was the maintenance of law and order and, if necessary, the defence of the territory. Following a nationwide scheme decided on in September 1791, the National Guard was organised on the basis of district or canton companies. Five of these neighbourhood units (designated as fusiliers or grenadiers) made up a battalion. Eight to ten battalions comprised a legion. Districts might also provide companies of veterans and young citizens, respectively drawn from volunteers of over 60 or under 18. Where possible, there was provision for mounted detachments and artillerymen. The citizens kept their weapons and their uniforms at home, and set forth with them when required. The initially multi-coloured uniforms of the various provincial National Guard units were standardised in 1791, using as a model the dark blue coats with red collars, white lapels and cuffs worn by the Paris National Guard since its creation. This combination of colours matched those of the revolutionary tricolour. The former Guet royal had held responsibility for the maintenance of law and order in Paris from 1254 to 1791, when the National Guard took over this role. In fact, the last commander of the Guet royal (Chevalier du Guet), de La Rothière, was elected to head the National Guard in 1791. In the summer of 1792, the fundamental character of the guard changed. The fédérés were admitted to the guard and the subsequent takeover of the guard by Antoine Joseph Santerre when Mandat was murdered in the first hours of the insurrection of 10 August placed a radical revolutionary at the head of the Guard. 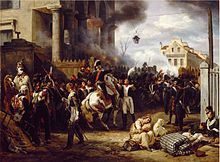 After the abolition of the monarchy (21 September 1792), the National Guard fought for the Revolution and it had an important role in forcing the wishes of the capital on the French National Assembly which was obliged to give way in front of the force of the "patriotic" bayonets. After 9 Thermidor, year II (27 July 1794), the new government of the Thermidorian Reaction placed the National Guard under the control of more conservative leadership. Part of the National Guard then attempted to overthrow the Directory during the royalist insurrection on the 13 Vendémiaire, year IV (5 October 1795), but were defeated by forces led by Napoleon Bonaparte in the Battle of 13 Vendémiaire. The Paris National Guard thereafter ceased to play a significant political role. Napoleon did not believe that the middle-class National Guard would be able to maintain order and suppress riots. Therefore, he created a Municipal Guard of Paris, a full-time gendarmerie which was strongly militarised. However, he did not abolish the National Guard, but was content to partially disarm it. He kept the force in reserve and mobilised it for the defence of French territory in 1809 and 1814. In Paris during this period the National Guard comprised twelve thousand bourgeois property owners, serving part-time and equipped at their own expense, whose prime function was to guard public buildings on a roster basis. Between 1811 and 1812 the National Guard was organized in "cohorts" to distinguish it from the regular army, and for home defence only. By a skilful appeal to patriotism, and judicious pressure applied through the prefects, it became a useful reservoir of half-trained men for new battalions of the active army. After the disastrous campaign in Russia in 1812, dozens of National Guard cohorts were called up for field duty the next year; four cohorts being combined to form one line infantry regiment. The 135ème to 156ème Régiments d'Infanterie de Ligne were thus formed. Many of these fought in the campaigns in Germany in 1813 and the invasion of France by allied Austrian, Prussian, Russian and British armies in 1814. Existing National Guard units, such as those of Paris, were deployed as defence corps in their areas of recruitment. Mass conscription was extended to age groups previously exempt from military service, to provide more manpower for the expanded National Guard. Students and volunteers from gamekeepers and other professional groups formed separate units within the National Guard. Clothing and equipment was often in short supply and even the Paris National Guard was obliged to provide pikes as substitute weapons for some of its new recruits. These field and regional units were disbanded in 1814 after the abdication of Napoleon I. Six thousand national guardsmen took part in the Battle of Paris in 1814. Following the occupation of Paris by the allied armies, the National Guard was expanded to 35,000 men and became the primary force for maintaining order within the city. Under the Restoration in 1814, the National Guard was maintained by Louis XVIII. Initially the Guard, purged of its Napoleonic leadership, maintained good relations with the restored monarchy. The future Charles X served as its Colonel-General, reviewed the force regularly and intervened to veto its proposed disbandment on the grounds of economy by the Conseil Municipal of Paris. However, by 1827, the middle-class men who still composed the Guard had come to feel a degree of hostility towards the reactionary monarchy. Following hostile cries at a review on 29 April Charles X dissolved the Guard the following day, on the grounds of offensive behaviour towards the crown. He neglected to disarm the disbanded force, and its muskets resurfaced in 1830 during the July Revolution. A new National Guard was established in 1831 following the July Revolution in 1830. It played a major role in suppressing the Paris June Rebellion of 1832 against the government of King Louis-Phillipe. However, the same National Guard fought in the Revolution of 1848 in favour of the republicans. This change in allegiance reflected a general erosion in the popularity of Louis-Phillipe and his "Bourgeois Monarchy", rather than any fundamental change in the make up of the National Guard, which remained a middle-class body. Napoleon III confined the National Guard during the Second Empire to subordinate tasks to reduce its liberal and republican influence. During the Franco-Prussian War the Government of National Defense of 1870 called on the Guard to undertake a major role in defending Paris against the invading Prussian army. During the uprising of the Paris Commune, from March to May 1871, the National Guard in Paris was expanded to include all able-bodied citizens capable of carrying weapons. Following the Commune's defeat by the regular French Army, the National Guard was officially abolished and its units disbanded. Also disbanded was the Mobile National Guard (Garde Nationale Mobile) raised in 1866 to provide personnel and officers for rapid deployment operations nationwide, as well as to provide reserve personnel for the armed forces. Despite its major role in the Franco-Prussian War, the National Guard was disbanded soon after the establishment of the Third Republic. Having been converted from a volunteer reserve into a much larger force composed mainly of conscripts, the National Guard had lost its identity and raison d'être. It also faced opposition from the army which was opposed to such a large armed force outside its direct control. The role of the Paris units of the National Guard in the uprising of the Paris Commune led to a great degree of hostility towards the National Guard, especially from the army. Perceived as an embodiment of the revolutionary republican "nation in arms" at the time of the Revolution of 1789, the National Guard was formally disbanded on 14 March 1872 as a threat to the security and order of the new Third Republic. The National Guard was superseded by the creation of territorial regiments, made up of older men who had completed their period of full-time military service. These reserve units were embodied only in times of general mobilisation but remained an integral part of the regular army. After several terror attacks in France, which intensified in 2014 and 2015, French President François Hollande declared the total establishment of a new National Guard. By his words, the Guard will be formed using military reserve forces. Hollande expected to start parliamentary consultations in September 2016 about this matter. On 12 October 2016, during a weekly meeting of the Cabinet, the National Guard was officially reconstituted after 145 years as the fifth service branch of the French Armed Forces under the Ministry of the Armed Forces. The revitalized Guard will also reinforce elements of the National Gendarmerie and the National Police in securing major events nationwide while performing its historical responsibility as a national military and police reserve service. It is expected that the new Guard will grow to a 72,500-member force in 2017 and grow to an 86,000-member national reserve in 2018. The formation of the revived Guard will be assisted with a dedicated 311 million euro budget and its personnel will now come from the reserves, members from the private sector and active personnel seconded to the service. Unlike the Guard of the Revolutionary Wars, its officers are today seconded from both the Army and the National Gendarmerie and are graduates of their respective academies. ^ a b "France to create new National Guard 'to protect its citizens'". Local.fr. Retrieved 28 July 2016. ^ a b "France to form National Guard to counter terrorist threat, Hollande says". France 24. Retrieved 28 July 2016. ^ Crowdy 2004, p. 14. ^ Mansel 2003, p. 4. One or more of the preceding sentences incorporates text from a work now in the public domain: Maude 1911, p. 229. ^ Mansel 2003, p. 13. ^ Mansel 2003, p. 217. ^ Mansel 2003, p. 218. Crowdy, Terry (2004). French Revolutionary Infantry 1789–1802. Oxford: Osprey. p. 14. ISBN 1-84176-660-7. Mansel, Philip (2003). Paris Between Empires – Monarchy and Revolution 1814–1852. New York: St. Martin's Press. pp. 13–14, 217–218. ISBN 0-312-30857-4. Maude, Frederic Natusch (1911). "Napoleonic Campaigns" . In Chisholm, Hugh (ed.). Encyclopædia Britannica. 19 (11th ed.). Cambridge University Press. pp. 212–236. Wikimedia Commons has media related to Garde nationale (Révolution française). Tulard, Jean; Fayard, Jean-François; Fierro, Alfred (1987). Histoire et dictionnaire de la Révolution française, 1789–1799. Bouquins (in French). Paris: Robert Laffont. ISBN 2-7028-2076-X. Bruce Vandervort, National Guard (France), on the online Encyclopedia of 1848 Revolutions, James Chastain, ed.